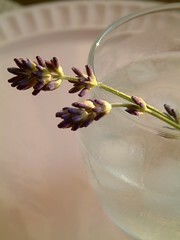 Thank you to the Inadvertent Gardener for the lavender syrup idea. Boil the water and sugar until the sugar dissolves. Add the lavender and simmer for 20 mins. Pour syrup, vodka and soda over ice. Add lemon to taste. Oh Wendy, I am addicted to lavender but I never tried lavender syrup… this will only fuel my addiction. Thank you! These sound absolutely delightful. What a fantastic idea! Mmmh! Sounds interesting! Do you have lavender in the garden or did you buy the flowers? Nora B – I just discovered it recently too! A real treat. Truffle – Delightful is just the right word. It felt like a special occasion just drinking it. Holler – I have lavender in my garden. Just a small patch at the moment but I’m hoping it will spread next year. I’ve picked most of the flowers already! I have a some great organic lavender growing in my garden. Have to try this! That sounds wonderful, I’ve notice people using lavender for cooking here in the states more and more. We can buy packages of it that are called;” Culinary Lavender”. Interesting use of the herb! It’s amazing how much can be done with herbs and how beneficial they can be for us too. Have you tried making lavender bread? Caroline – Thanks for popping by. I haven’t tried making lavender bread but really want to now! It sounds heavenly. I did enjoy-but I omitted the soda water and lemon. It was still great. So good, I had to blog about it too. Thanks for the recipe! ooo just found this – how gorgeous! Figs Olive Wine – Worth trying for a treat! I tried this with honey lavender syrup and it was excellent!